A dental implant is a titanium screw that is inserted into the jawbone beneath the gumline. Over time, the implant fuses with the bone in the jaw through a natural process known as “osseointegration”, providing a stable base for a new artificial tooth. 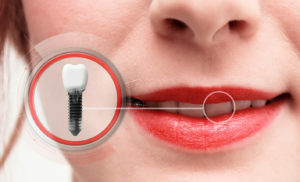 Dental implant treatment is generally accomplished in three parts over the course of several months. Once completed, individuals with dental implants are able to eat all their favorite foods without worry and can speak, smile and laugh with confidence. A dentist in Millburn can evaluate you to see if you would be a good candidate for dental implants. In addition to the above medical and dental steps, your dentist will sit down and have a conversation with you about the treatment options available. He or she will discuss the details of the procedure, how much it will cost and possible complications. From there, your dentist will work with you to develop a treatment plan that best fits your specific needs and preferences. If you have a gap in your teeth or are tired of conventional dentures slipping in your mouth, talk with a dentist in Millburn today about whether dental implants are the right treatment option to rejuvenate your smile. Winner of a 2015 Patient’s Choice Award for Dentistry, Dr. Robert Shick has the knowledge and the skills to rebuild failing smiles with high-quality dental implants. His commitment to excellence leaves patients with winning smiles and a renewed sense of confidence. To discuss with Dr. Shick whether dental implants are the right tooth replacement option for you, visit his website today or call the office at 973-921-9097.